Note: US Dept. of Transportation requires that trailers equipped with brakes have a trailer break away system for activation of the trailer brakes, in the event that the trailer should become detached from the tow vehicle during highway travel. Trailers equipped with electric brakes typically use an emergency breakaway battery kit such as the TAP Brakemaster kit. The battery for this system MUST be able to maintain brake activation for 15 minutes minimum. The break away system normally contains a battery trickle charger for battery maintenence. Brake controller wiring - Install auto reset circuit breaker in positive [Black] wire from battery to brake controller. 20 amp for 4 magnets 30 amp for 6 or more magnets. Trailers with 8000# or larger axles should have magnet amp requirements determined before sizing circuit breaker. Red wire connects to [cold -non activated] side of brake pedal stop lite switch. Black wire connects to 12VDC positive White wire connects to battery negative Blue - Brake controller output to trailer electric brakes. Improper connection of Positive and Negative wires MAY damage or destroy brake controller. 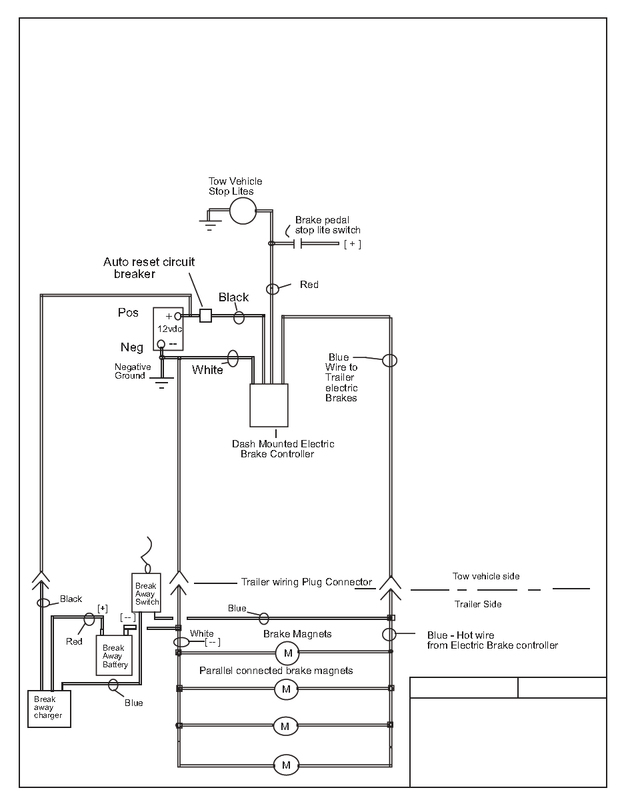 Confirm wiring diagram instructions with your Brake Control Manufacturer. Solder or use compression crimp connectors for best system operation. DO NOT USE Pinch type connectors Electric brakes have about a 3 amp current consumption per magnet at max power output. Loose connections can cause extreme loss of braking power. All technical or design information & specifications contained in this drawing are the property of Champion Trailers. Technical information contained herein may not be applicable to your system. It is the users responsibility to confirm the compatability of information contained herein with his system.